Ingram Micro’s international network of fulfillment centers includes locations in the United Kingdom and Europe. From our UK distribution center, we offer retail and wholesale storage, packaging, and order fulfillment services. Whether you already sell products in the UK or are interested in expanding your business into the UK and European markets, Ingram Micro can help. If you already sell in the UK, plugin to Shipwire to eliminate the headaches of storage (fulfillment center) and shipping (order fulfilment). With one call, you will learn how to contain costs, eliminate employee headaches, and prepare your business for growth. If you don’t yet sell in the UK, or if you think selling to international buyers is too time consuming or costly the Shipwire Platform enabling our Ingram Micro fulfillment center makes it much easier. Shipwire can help you move inventory to our Ingram Micro fulfillment centers in Britain/UK. Having a local fulfillment center means you can clear customs once (in bulk). Eliminate the risk, headache, and cost of clearing customs on a per order basis. Shipwire can help you with importing and freight forwarding. Quickly add a fulfillment center and order fulfillment to most popular shopping carts, Yahoo! Stores, and PayPal. Shipwire offers a completely free trial. You don’t need to enter your credit card to try our services. 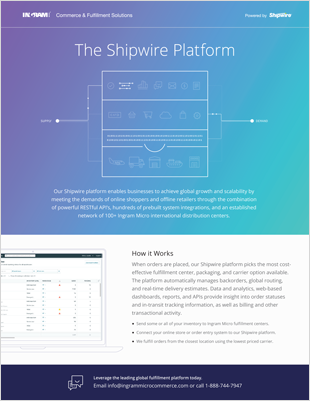 Our printable Overview PDF guide explains how Shipwire works and how we can help your business. Learn how to save time, grow sales, and expand globally with Shipwire’s award-winning order fulfillment platform.